Credit cards make it more convenient to pay for big-ticket items or cover everyday expenses if you're short on cash. Credit cards can be secured or unsecured; the type of card you qualify for largely depends on your credit. Secured and unsecured credit cards function in a similar way when making purchases. There are, however, a few key differences you should keep in mind before applying for either type of credit card. With a secured credit card, the card issuer requires a cash deposit, which acts as your collateral. Your credit limit is either the amount of the deposit or slightly less. You might be able to increase your credit line by depositing more money with the card issuer, or it may automatically be increased after you've established a positive payment history. An unsecured credit card requires no initial cash deposit and your card limit is based on your credit history. According to Bankrate, secured credit card limits typically range from $300 to $500. Unsecured credit cards can have limits ranging from several hundred to several thousand dollars. 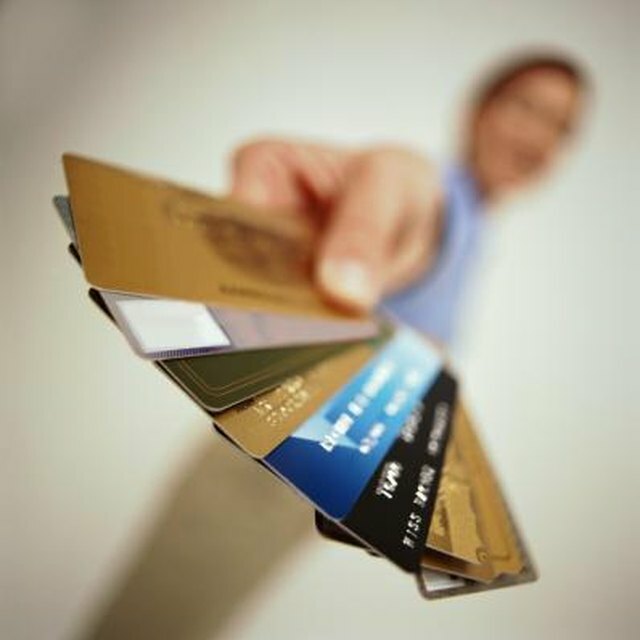 Your credit history plays a large part in determining which type of credit card you qualify for. If you have a low credit score because of multiple delinquencies, charge-offs or bankruptcy, you might only be eligible for a secured card. A secured credit card might also be your only option if you're just beginning to establish your credit history. With a credit score in the fair to excellent range, you should qualify for an unsecured card. A card issuer might also consider your income and expenses when making the decision. Secured cards tend to be more expensive in terms of the fees and the annual percentage rate of interest you can expect to pay compared to an unsecured card. Depending on the card issuer, you might have to pay an annual fee, a monthly service fee or an account setup fee to open a secured card. Interest rates also tend to be in the neighborhood of 20 percent or higher. With an unsecured card, the better your credit is the lower your APR will be. Many unsecured cards charge no annual fee at all while others allow new members to waive the fee in the first year. What Exactly Is a Bank Secured Credit Card and How Do They Work? How Many Points Can Secured Credit Cards Raise Your Credit Score? When Do You Get Back Your Deposit on a Secured Credit Card? If you're looking to rebuild bad credit or start building your credit history, a secured credit can be a useful stepping stone to achieving your goal. Secured cards are also a good choice if you're worried about racking up thousands of dollars in debt, because they tend to have much lower credit limits. If you've already established good credit, using an unsecured card gives you more spending power. Certain cards also allow you to earn cash back or rewards points on purchases, which can add up to big savings. With either type of card, you'll have to pay the balance in full each month to avoid paying interest.